I like learning new technology. Playing around with it, getting a feel for it. For this, I prefer POCs that are more substantial than the typical 'hello world' stuff. What would I learn from that? Some years ago my interest in Neo4j was awakened by Michael Hunger and Dirk Mahler (through jQAssistant). 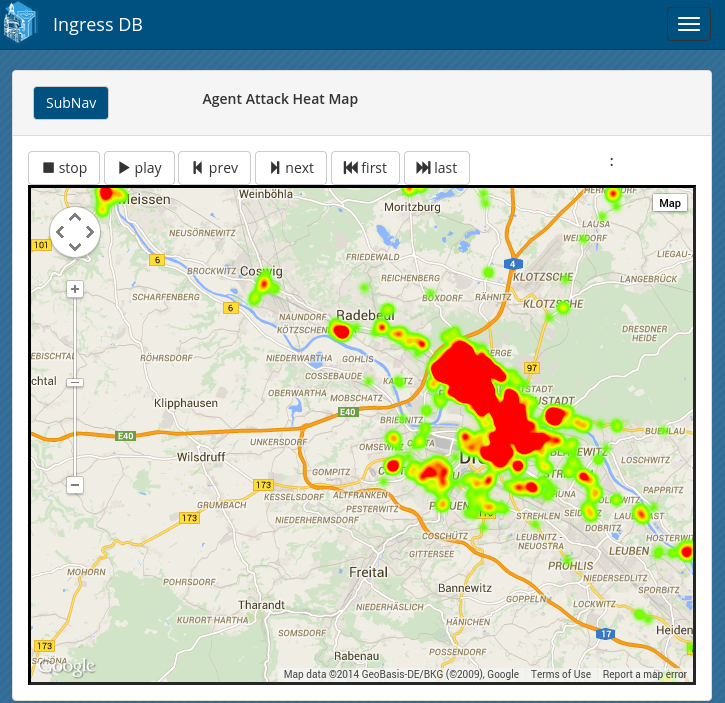 Looking around for something that would allow me to play with Neo4j and be of use for me, I decided to build a database from available Ingress data. You may have heard of the AR game PokemonGo. Ingress is similar in that you have to walk in the real world and visit certain places. Those places are called portals and are player generated POIs. Players, called agents, belong to one of the 2 factions Enlightened (green) or Resistance (blue) and fight over those portals. Portals can be linked building triangular fields, scoring points for the owning faction. How this could look like can be seen in the image of the map above. Portals can hold up to 8 resonators and you need at least 8 players to build a portal up to the highest level. These, and other similar rules, 'forces' players to play together. In fact, the communities that build through this where the only reason to continue playing for me. Privacy concerns: Location-based games as Ingress allow players deducing the location of other players. 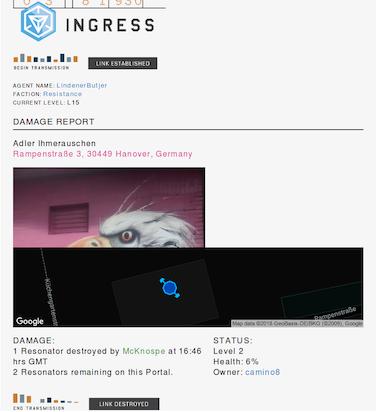 Ingress, as one of the first games of that kind is among the worst, as it displays a log of player actions. 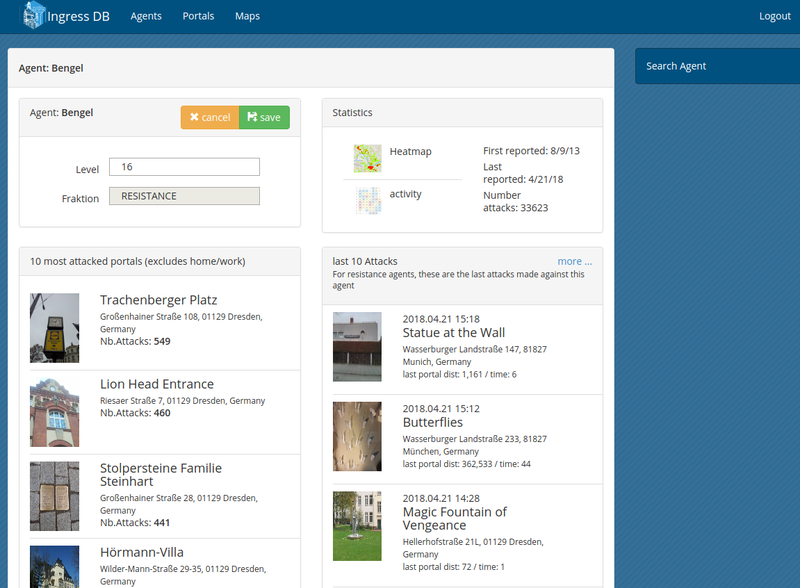 Most players play during commuting, giving away information about their home and work locations. I wish such games would warn new players prominently before starting. 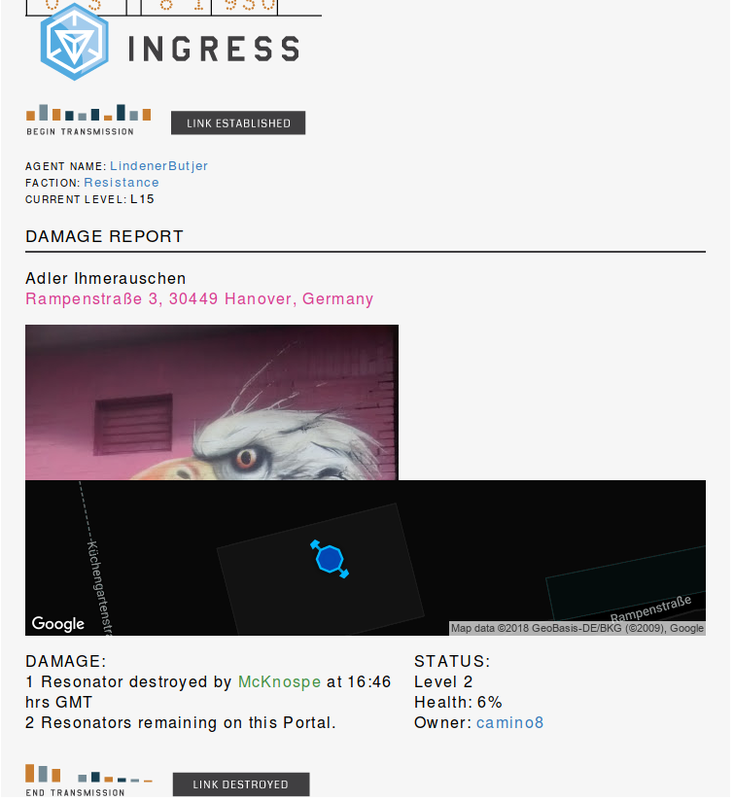 IngressDB aggregated that information and made it more accessible. This has always been a concern and led to the closing of IngressDB and deletion of the data in April 2018. Of course, all of this in a hard to parse HTML felt like it was designed in 1970. Luckily, the fabulous jsoup library helps to parse just about all that ugly HTML. My idea was to gather and parse all those emails and generate heat maps, showing player activity on a map. For this, I needed a way to perform simple spatial queries, e.s. bounding box ('give me everything inside that box') kind of lookups. Luckily, there existed a spatial plugin for neo4j. Documentation was sparse, but my use case was simple enough to find out how to use it. 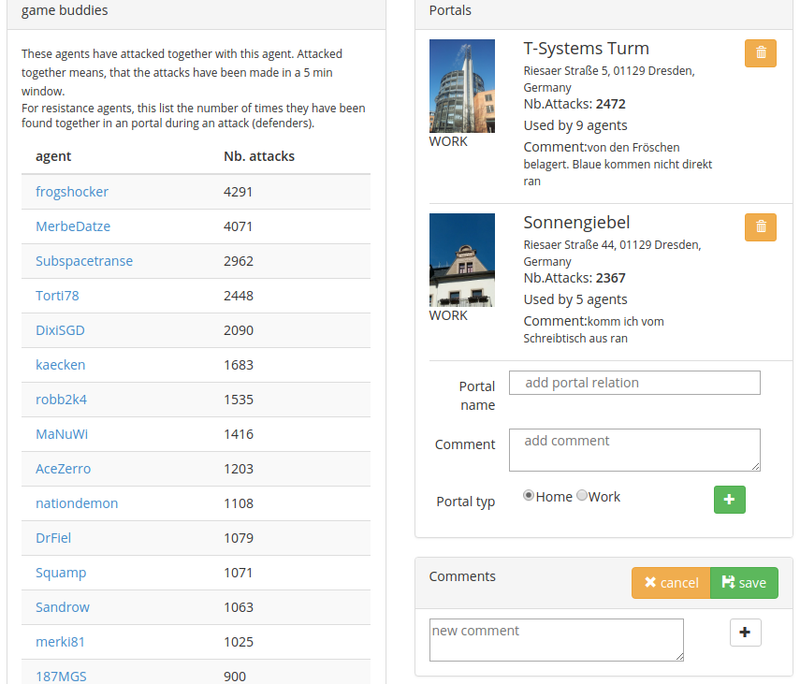 Expecting that attacks are the most frequent entity, I decided to group all attacks on a portal within a certain time window into one PortalAttack. It made the writing logic slightly more complex but allowed for easy lookups later on for the functionality to lookup 'game buddies': agents often playing together. 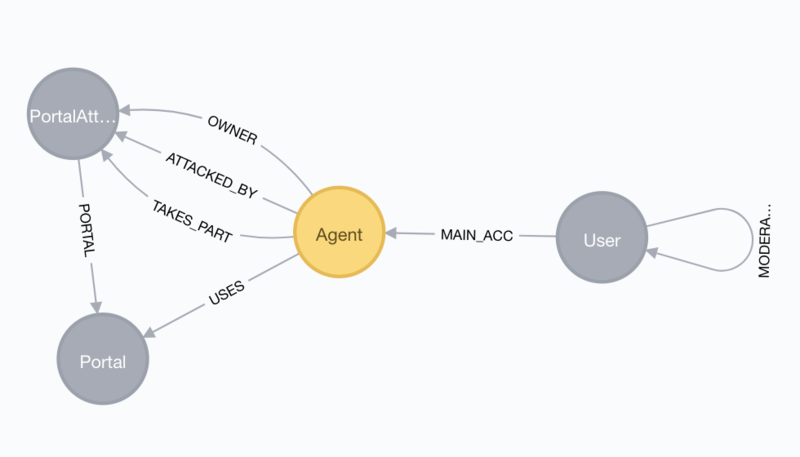 The :USES relation was later used to map home/work portals to agents. The User node represents the player; the actual human. As the ingress communities were/are in love with google plus communities, these are linked to google ids. Due to privacy concerns, I removed the ability to freely link agents to users and only allowed registered users to create a link between their agent and user. The app quickly gained popularity, so I needed a way to track who approved a user, resulting in the :MODERATOR relation on the User. Other features allowed to see portals one has interacted with on a map. Or a weekday/time of day activity table. Not exactly big data, but enough to show me that neo4j can handle data even on sub-par hardware very well. The project started with neo4j 1.9.5 and spring-data-neo4j 2.3.3.RELEASE. At that time, the recommended way to use neo4j was in the embedded mode. Due to the use of the spatial plugin, I could not always use the newest version of neo4j and spring-data. With the new versions came the usage of neo4j in proper server mode, which allowed me to separate the email parsing and storing component from the web part into two independent running artefacts. With the newly released version 3.5 of neo4j, my life would have been a lot easier, as this version does now include basic spatial functions without the need for a plugin. Also, the improved write speed and the added time datatype(s) would have been very welcomed when I was developing the application. All in all, developing with neo4j has been a pleasure, I learned a lot along the way. Its been my first NoSQL database to use and I was feeling uncertain about not having a schema to rely on. But this turned out to be easy. Due to a bug, I did have to refactor the data later on and ran into problems with too large transaction for the available memory. But with APOC and help from Michael, this could be solved as well. People asked for the source code of the IngressDB, but I’m hesitant to show it. It grew out of a POC and I never found the time to clean up. Just to add new functions. But I created a gist showing the repository layer with the cypher queries. Comments welcome.